I really thought I had gotten some Star Wars fatigue. In the build up to the release of Star Wars: The Last Jedi I just wasn't feeling that usual excitement, but as the day of my screening got closer it started to swell. As I sat in the theater I couldn't help but feel a little giddy that I was going to watch a new Star Wars movie, and then when the opening crawl kicked in and that iconic John Williams score blasted out I was hooked again. Star Wars did whatever it is that Star Wars does to us as society and I was fully excited. Of course there was still a movie to actually watch, and, as the prequels showed us, that can put a pretty big damper on things. The Last Jedi picks up very soon after The Force Awakens ends. The Empire First Order has delivered a crushing blow to the Rebels Resistance by blowing up the central planets of the Republic, and is looking to now wipe out the last of the fighters led by General Leia Organa (Carrier Fisher). Rey (Daisy Ridley) is on an island with Luke Skywalker (Mark Hamill) trying to get him to train her and return to the fight, while Finn (John Boyega) and Poe Dameron (Oscar Isaac) are fighting alongside General Organa to try to save the Resistance from the First Order. Meanwhile on the dark side, Kylo Ren (Adam Driver) is suffering from some inner turmoil over his actions in the last film and Supreme Leader Snoke is upset about his failure to destroy Rey and find Luke. General Hux (Domhall Gleeson) is angrily chasing after the last remnant of the resistance, eager to rule the galaxy. From there the plot gets pretty Star Wars as things must be destroyed in order for other things to happen and our heroes dive head first into doing so. 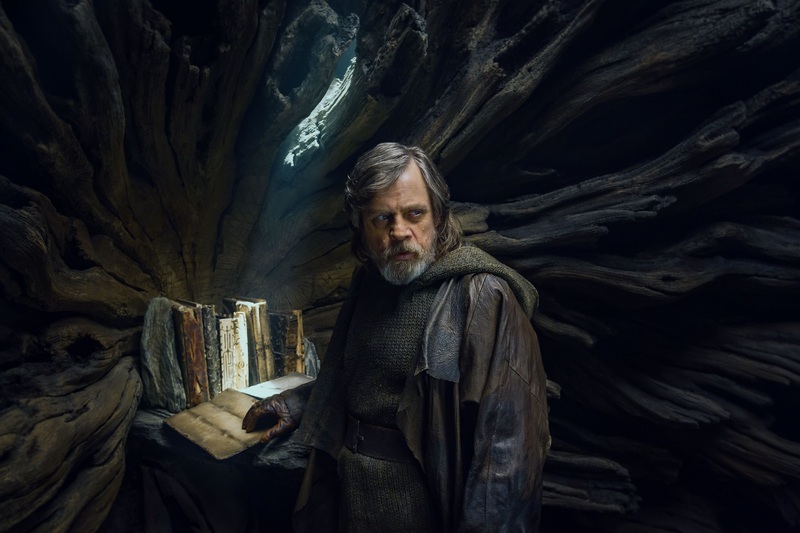 Rey's story plays out a bit slower than the rest of the crew, which can lead to some pacing issues as the plot drags a bit, but it's all in favor of delivering a wonderful and in-depth look at Luke Skywalker as the last Jedi, and his terrible failure of training his nephew. Luke and Rey's time together might be the best way the mysteries of the Force have been handled yet, though that's not saying much given midichlorians are still canon. Despite this, the new movies are doing their damndest to never mention them again. Thankfully, this leads to a treatment of the Force that is far more in line with what everyone but George Lucas thought of it as. That being said, the Force seems ill-defined in its abilities at times. It's always been a bit of a McGuffin for the series, adapting its powers to whatever the plot needed, but this time around it feels especially flimsy in its own rules. Of course this is a fictional film and can define the rules as it wants, and as such, it has established these norms as canon, and in turn made them concrete. Given the movie does some really cool things with the Force and they aren't even involved in fighting, director Rian Johnson uses a big ol' force McGuffin to drive his plot forward in an interesting and creative way. The movie leaves a few other things on the table as it moves along. I'm not up on my Star Wars backstory to the level that some are -- I don't read the books or comics that Disney has surrounded their new canon with -- and so that may leave me a little behind on details scattered throughout, but that also puts me in the same place as most of the film's audience. As such, there are moments and characters seeming like they aren't quite fleshed out enough. Supreme Leader Snoke is one of these, and it hurts the movie a little as the rest of the characters around him are delivered on fantastically. But I'm getting negative by picking at the seams of a fantastic tapestry, so lets start gushing. 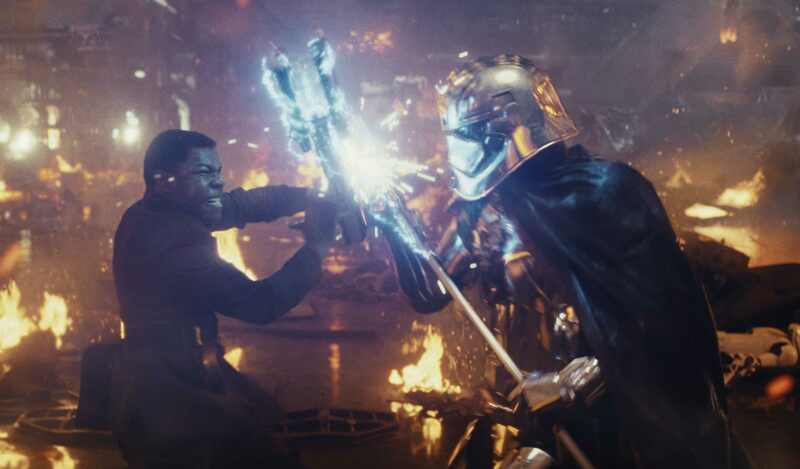 The Last Jedi may open up with one of the best space fights the series has ever seen, and it carries that quality throughout despite the small aforementioned pacing issue. It has one of the best light saber fights, one of the best endings, and some of the most fun the series has seen. Director Rian Johnson's love and passion for this franchise oozes out of every frame (especially frames with Luke in them), to the point you worry that he's gone a bit too fanboy. However, at every moment when things could go that direction he pulls himself back. There's the same comedy that made the originals so endearing, but also a honest love of these characters opening up into epic battles of light vs. dark. Johnson's direction is easily some of the most captivating of the series. He has a visual eye for shots and action that no director on Star Wars has previously had (or been allowed to have). There are moments in this movie that felt like seeing the original films as a kid did. Back then much of the awe and wonder was from having never seen anything like it before, but now it comes from the creativity and care put into every scene. There is a moment in the movie when in the background of a quick shot a giant sea creature's tail emerges from the ocean for no other reason than to say, "This is a living, wonderful world, full of adventure and life." That may just be a little thing, but it speaks volumes to the level of commitment and passion gone into making the film. Johnson also knows the difference between homage and plagiarism. One of the biggest issues with the very good The Force Awakens was that it was basically just a remake of A New Hope. The Last Jedi runs into this issue as well -- given the set up it was given -- and is basically the set up for The Empire Strikes Back, but instead of delivering a copy it delivers an interpretation. Many of the scenes here are clearly cribbed from both Empire and Return of the Jedi. A young, impatient student with a disagreeable master? A dark lord torn between family and power? You've seen this all before and not just in Star Wars. The difference here is that Johnson makes it his own. Kylo Ren and Rey are not the same characters as Vader and Luke, and this is not the same movie. It may be playing the same song, but it's doing it in its own style. This is how homage works. This is how you remember what everyone loves, but press forward into something new. But the old is still good. Hamill's Luke is a revelation of turmoil and awesomeness. The actor, who can't ditch his boyish charm despite a grizzled look, is powerful in his return to the role that made him famous. Johnson pulls out of him a performance I honestly didn't think he was capable of and the interplay between him an Rey is fantastic. He also gets all the best lines. He isn't the only star, though. Driver's Kylo Ren is even more unstable and deliciously demented than before, with his loyalties being pulled in multiple directions and his child-like temperament once again driving him forward. It's a fantastic turn for the actor who seems to seethe and rage with his entire being. That's especially true when compared to Ridley's Rey, who sadly lacks the depth in this film to be much more than the central pivot of which the plot revolves. It will be interesting to see where they take the character as this film was definitely more of a bridge for her (an issues all middle films of trilogies have). Everyone else is pretty stellar as well, but I just have to rave once again about Domhnall Gleeson's General Hux. The character is just so over-the-top and wonderful, and Gleeson plays him with such maniacal glee that I'm overjoyed we get even more of him this time around. We can (and will) pick this movie apart in the coming weeks. Are there Death Star size plot holes? Of course. Space operas are built on plot holes, archetypes, and cliche. That's why they're so easy to screw up, and so impressive when they're done right. The Last Jedi is done right. There are about 50 million other things I want to discuss (Porgs! ), and probably will in the coming days when everyone has seen the movie, but what really needs to be said is this is the Star Wars we were promised. It takes the series in a new direction while still loving the old. It firmly passes the baton onto the next generation of heroes while still delivering our old favorites. Johnson has made a Star Wars movies that feels like Star Wars without simply being a remake. If the franchise is in his hands now then they're great hands to be in.